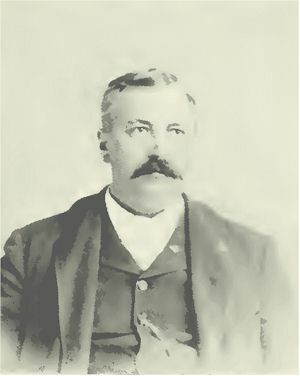 Charles S. Puntenney is one of the leading men of the vicinity of Lookout, Nez Perces County, having a general merchandise store and a hardware establishment there. He was virtually the founder of the business industries of the place, although the name had been given when he came there. He is a native of Parke County, Indiana, being born on September 29, 1858, the son of James N. and Mary A. (Hamlin) Puntenney. The father was also born in Parke County, Indiana, on August 3, 1831, and still lives in Butler, Illinois, where he was in the state militia at the close of the Civil war. The mother of our subject was born in Springfield, Illinois, in 1839, and her father, a Methodist preacher, was a native of England, and followed preaching in Illinois. He was a younger brother of Emmons Hamlin, the famous musical instrument manufacturer. Mrs. Scott, the mother of Mrs. Puntenney was of Scotch descent, born in Kentucky and a relative of General Winfield Scott. Our subject was taken by his parents to Illinois while an infant and the father settled in Montgomery County, where he is an honored citizen. Charles gained his education there and remained at home until twenty-one. He was then a cowboy over southern Colorado, freighted and labored in the mines, where he did well. Later he returned to Butler and operated the home place and then went into the drug and grocery business in Butler. For eight years he continued thus and was prospered. In 1887, he sold out and went to Paris, Illinois, taking up the creamery business. After this we see him dealing i n farm implements and then manufacturing a patent bed spring, in which he prospered. Selling out, he returned to Butler and went into the mines. Afterwards he was in Connellville, Pennsylvania, operating in a dry goods store and also in the mines. In March, 1891, he came to Boise and soon thence to Moscow. In this last town he remained in the grocery business until he sold and came to his present location in 1899. Since coming here he has done a good business and is carrying a good stock in his general store as well as in the hardware department. On November 28, 1897, occurred the marriage of Mr. Puntenney and Miss Ida, daughter of Levi and Maria (Browning) Smith, in Hood River, Oregon, while she was visiting her sister and brother there. The father was born in Pennsylvania and mother at Baltimore, Maryland, and both died near Dayton, Indiana. Mrs. Puntenney was born in Tippecanoe County, Indiana, on July 20, 1858. Mr. Puntenney has the following brothers and sisters, Lizeth Roberts, in Litchfield, Illinois; Minnie E., teacher for years in Normal schools, Sarah E., deceased; Laura E., at home; Lylah A. Reagan, in Indiana. Mr. Puntenney is a member of the I. O. O. F. and of the W. of W. His wife is a member of the Methodist church. Politically, Mr. Puntenney is a Prohibitionist and takes an intelligent interest in the affairs of government. His grandfather on his father’s side was a veteran of the Mexican and Black Hawk wars. Mrs. Puntenney had uncles on both sides in the Civil War, while Mr. Puntenney’s uncle, Munson Hamlin, fought in that awful struggle also.